…Record. That in case the parrents of schollers cannot afford for their children’s dyett in any inn or ale-house within this Towne, then the Maior and Cowncell, or the major part of them, doe seek a place convenient and the rate. In 1653 Roger Owens or Richard Owens became the first schoolmaster, assisted by an usher named Owen Picton. The former was to receive £40 per annum and the latter £20. In 1654 Owen Picton, usher, had temporary charge of the school and an increase in salary of £6, implying that R. Owens had already left. The annual sum of £60 paid by the Commissioners for the Propogation of the Gospel in Wales ‘…out of pity and goodness…’ since 1653 ceased to be paid from the time of the Restoration. The expense was then shouldered by Cardigan Borough Council. Ca. 1662 Rev. James Davies came to Cardigan and became the Master, succeeding Rev. Charles Price. Both of these men were Nonconformist preachers. In 1664 Mr. Ryland was the Master. On 1st October 1739 Rev. David Jones, the Curate of Cardigan, replaced David Davies as Master. On 5th October 1741 Thomas Lloyd, the Mayor, appointed Richard Watkins as the Master of the school until 1747. On 5th October 1747 Rev. John Davies was appointed the new Master. On 22nd October 1751 Thomas Watts became the new Schoolmaster and remained so in November 1765, when he was accused of assaulting shoe-maker David Thomas. In 1774 the school was without a master following “…the resignation of Mr Meyrick, the late master…” He may have been Rev. Edward Meyrick, later of Bath and Wells. He was succeeded on 3rd October that year by Rev. Charles Harries. On 2nd October 1786 the Letitia Cornwallis bequest of £200 was granted towards the running of the school. In 1787 Rev. John Rice was the Master. In 1788 Rev. John Thomas was the Master. Demosthenes against Philip William Leslie. Parting of Hector & Andromache (Greek) David Lloyd. Elegy on Sir Thomas Picton ( Welsh) William Davies. The Dog and the Fox Richard Mathias. Rivers and Sir Harry Thomas Jenkins; Griffith Jenkins. H K. White’s Ode to Disappointment Thomas Lewis. Lord Byron’s Farewell George Nugent. The Wreck (Welsh) David James. Brutus on the Death of Caesar Thomas Williams. T. Quintias; Speech to the Romans Owen Lloyd. Sir John Melvin and Sterling David Lewis; Thomas Lewis. Belcour and Stockwell George Nugent; William. Harries. Guadarama, Lorenzo, and Merchant William Leslie; Richard Lloyd; Owen Lloyd. Lady Townly and Lady Grace William Lloyd; Hugh Howell. Aesop and Beau Thomas Lewis; David Lewis. Sir Charles and Lady Racket John Howell; Richard Mathias. 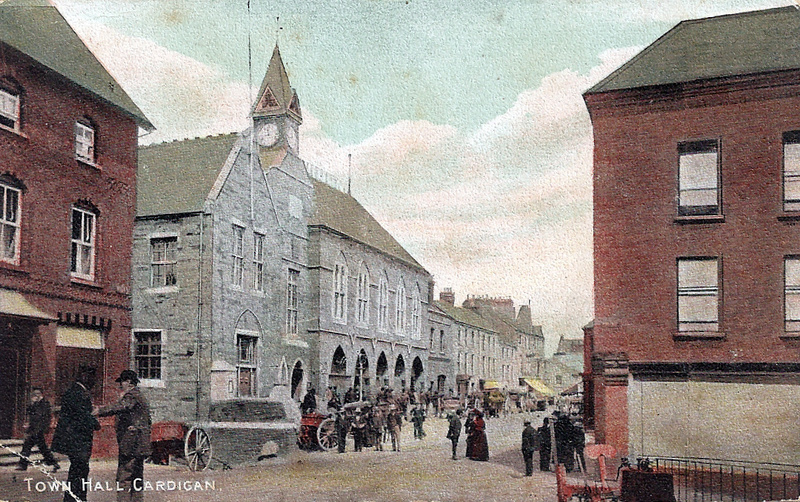 “…TO THE MAYOR, ALDERMEN, AND COMMON COUNCIL OF CARDIGAN. I find that the grammar-school of this town, after a long vacation of some months, is again re-opened under the mastership of a stranger, and of your choice and appointment. Whether this appointment was judicious, or whether the person selected be competent for the situation is not so much the business, or rather the subject of this address. If he is competent, the greater will be your loss when he leaves; but leave you, most certainly he will, on the very first event he gets another, and a better, fish to fry. Then, if he is not a fit person, the sooner the better he leaves you. But what I would tell you gentlemen, on the present occasion is, that a school sometimes open and sometimes closed, forever changing its masters, like the Cardigan grammar-school of late years, can never flourish – cannot be of much profit, nor prove of any advantage to the town and neighbourhood in which it is established. If you compare the current state of our school to what it was some years ago when the master was permanent amongst us, and not flitting like a bird of passage you will, I know, immediately allow, that what I tell you is correct. Parents will, and indeed you cannot expect them, to put their children in a school conducted under circumstances of such uncertainty, that even you yourselves cannot inform them, although it is open now—how long it will continue to be so. A burnt child they say, dreads the fire, and I am afraid that the good people of this town and neighbourhood have been so often disappointed with this kind of come-and-go game, that it will take our school many a long year (under the best of masters) to regain its former celebrity. Then, if a school before it can answer the purposes, for which schools are generally intended, must go on, and continue to go on, in a steady, regular, and uninterrupted course, it devolves on you, into whose hands is committed the care of this once very respectable institution, to put a stop at once and for ever to what I complain of. There are other abuses connected with the management of this school, which loudly call for, and ought to have, your immediate and best attention but I shall notice only one of them, and that is, the description of boys admitted into it on the foundation, as free scholars. Many boys are thus admitted, whose parents are well able to pay for the education of their children, but by some means, they saddle them on the charity, originally intended for the poorer classes of the place. I have now perhaps said enough for this time, however, if I find that what I have stated is well received, I may again lay some useful particulars before you; but do not think tor a moment that I would dictate to you, nor do I address you out of ill-will, all that comes from me emanates from a sincere desire to be of some service to my native town, and to see the old free-school revive and flourish once more. Having observed in your valuable paper last week a statement that the Corporation is possessed of the property on which the Grammar-school stands, 1 beg to inform you that such is not the case, inasmuch as it was granted as a site for the School about a century ago, and, consequently, is the property of the master for the time being. There are other premises, also, which at one time did belong to the School, but which have now been appropriated elsewhere. On undertaking the mastership, however, I voluntarily signed that I would give it up for the benefit of the town, on being provided with another room and have advocated this, and would still further advocate it to my fellow-townsmen, as the best possible site for the. greatly-needed market-place, as it is situated in the very centre of the town. As my pen is on Schools, I trust that you will allow of a few remarks that occurred to me on reading the excellent speeches delivered at the Yorkshire Welsh Meeting, in which, with a laudable desire! for ;the improvement of their native country, most of the speakers dwelt upon the falling off of schools in Wales, attributable in some instances to the smallness of the endowment, in others to neglect. I may bring Cardigan School (which in former times stood high) as an instance of the former-the endowment is only £20 per annum for the instruction of six boys. The higher classes in Wales fancy that learning is only to be acquired in England, and value the instruction according to the price paid for it, while the other classes are unable or, at any rate, unwilling to pay anything but a nominal sum for the Instruction of their sons. These are some of the causes that have ruined schools in Wales. Powers to Corporation of Borough to establish Markets and Slaughterhouses, to supply Water, to Pave, Light, Water, Cleanse, Regulate, and Improve the Borough, to Purchase Corn and other Market Tolls, and other Purposes. 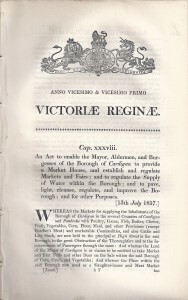 “To Erect and Provide, in and for the said Borough, a Market-place and Market-house and Rooms, to be used or let for the transaction of public and other business in the said Borough, with suitable Buildings, Offices, Sheds, Stalls, Standings, Works and Conveniences connected therewith or attached thereto and to authorize the holding of a Market or Markets in such Market-place and Market-house, on such days and at such times as the Corporation shall from time to time determine, for the sale of butcher’s meat, poultry, game, fish, butter, cheese, fruit, vegetables, corn, flour, meal and other provisions, articles, matters, and things, and of all other marketable commodities; and to define the limits of such Markets or Market-place and for preventing, after the establishment or erection of such Markets and Market-place, sales in the public streets and other buildings and places not being private shops, of any provisions, articles, or marketable commodities, for the sale of which such Market or Market-place has been provided and for preventing the use, as a public Market or Markets, of any place or places, or of any buildings within the said Borough not being private shops, and for preventing the hawking of any marketable commodities within the said Borough. To appropriate one or more Room or Rooms in the Building so to be erected for the use of the Free Grammar School under the control of the Corporation and also the Divinity Library attached thereto, with proper Offices for the use of such School and Library. To appropriate and use a certain Piece of Ground belonging to the Corporation, situate on the west side of High-street, otherwise Pendre, in the Town of Cardigan, called the Free School Bank, and the buildings on or adjoining the same, fronting on the said street and also belonging to the Corporation, for the Site of such Market-place, Market- house, Building, and Conveniences. To Purchase, compulsorily or otherwise, all Interests (if any) in the Lands so to be appropriated for the Site of such Market-place, Market-house, and Buildings, the boundaries of which said Piece of Land and Buildings so to be purchased compulsorily, and the termini of the proposed works thereon, are shown on the plan of such lands, to be deposited as hereinafter mentioned. To Erect and Maintain a Public Slaughterhouse or Public Slaughterhouses, and to prohibit the slaughtering of animals within the said Borough except in the Slaughterhouse or Slaughterhouses so to be erected or in any private Slaughterhouse or Slaughterhouses which may be Licensed by the said Corporation for the purpose, and to enable the Corporation to License Private Slaughterhouses, and to regulate all Slaughterhouses, as well public as private, within the said Borough. To appropriate and use a certain Piece of Ground, and the Buildings thereon, belonging to the Corporation, situate out of the said Town but within the said Borough, near to, and opposite to, the brook or stream called the river Muldan, or Muldan brook, formerly known by the name of the Cardigan Poorhouse, and now in the several occupations of: William Jeremiah, Elizabeth Martin, David Jeremiah, John Jeremiah, George Davies, Evan Jeremiah, Ann Williams, Margaret Evans, Thomas Lewis, and Hannah Lewis, for the Site of such Public Slaughterhouse or Public Slaughterhouses and all Conveniences connected therewith, and to purchase, compulsorily or by agreement, the same Piece of Ground and Buildings, in case the existing agreement for the purchase thereof by the Corporation shall not be duly completed. To Purchase, by agreement and not by compulsion, a convenient Site for, and to establish and maintain within the said Borough, a Market-place for holding Markets or Fairs, and to establish and hold therein Markets or Fairs on such days as the Corporation may from time to time appoint, for the sale of horses, cattle, sheep, pigs, and other animals, matters, and things, and after the completion of such Cattle Market or place for Fairs, or after such other period as may be prescribed by the said Bill, to prohibit the sale of horses, cattle, sheep, pigs, or other animals, matters, or things, in the streets, roads, or lanes within the said Borough, or such other limits as may be defined by the Bill. To Purchase, compulsorily or otherwise, all Corn Tolls, Market Tolls, and other Tolls, Rates, Rents, Dues, Stallages, and Charges, now legally leviable or demarkable within the said Borough and to confirm any agreements entered into by the Corporation for the purchase of all or any of such Tolls, Rates, Rents, Dues, Stallages, and Charges, and to levy and receive Tolls, Rates, Rents, Dues, Stallages, and Charges, in respect of the Markets, Fairs, Market-p!ace, Market-house, Rooms, Buildings, Weighing Machines, Slaughterhouses, and Conveniences, to be so established by the Corporation, and to confer, vary, or extinguish exemptions from the payment thereof, and to confer, vary, and extinguish other rights, privileges, and exemptions, and also to manage and regulate such Markets, Fairs, Market- places, Market-house, Rooms, Buildings, Weighing Machines, Slaughterhouses, and Conveniences respectively. To enable the Corporation to Maintain and Improve the existing Waterworks within the said Borough, over which they now exercise control, and from such Waterworks to supply with Water the Inhabitants of the said Parish of Saint Mary, in the County of Cardigan, and of the hamlets or places of Bridge End and Abbey, in the Parish of Saint Dogmells, in the County of Pembroke, and all other persons, and all buildings and places within the said Borough. To Lay Down and Maintain Pipes, Culverts, and other Works, in, under, over, or across any Private Lands; and to break up, alter, or stop up, either temporarily or permanently, any Turnpike and other Roads, Highways, public and private Streets, Public Places, Bridges, Railways, Sewers, Drains, Rivers, Brooks, Streams, Watercourses, Quays, Wharfs, and other places, public or private, within the Borough. To Levy Rates, Rents, and other payments for the Water supplied by the said Corporation to alter the existing and proposed Water Rates, Rents, and other charges, and to confer, vary, or extinguish exemptions from the payments of such existing and proposed Rates, Rents, and other charges and other rights and privileges. To Pave, Light, Water, Cleanse, Drain, and otherwise improve and regulate the said Borough; to License and, by bye-laws or otherwise, to regulate all Hackney Carriages, Horses, Mules, or Donkeys, plying for hire within the said Borough, and the charges to be made for the same and the places at which they may stand or ply for hire also, all Boats, whether for the purposes of fishing or pleasure, using the beaches or shore of the River within the said Borough; also, all Bathing Machines, and the placing thereof, and the charges to be made for the same and also to regulate the general management of Vessels navigating the said River within the limits aforesaid, and also to pre- vent Vessels from discharging their ballast in any part of the said River within the limits of the said Borough, and to impose penalties for the breach of such regulations. To regulate and improve the formation and construction of all public and private Streets, Roads, Lanes, and other places within the said Borough. To construct Sewers and Drains, and make Outfalls and Communications into the river Tivy, or the Muldan brook, or into any sewer running thereto, or otherwise provide for the effectual Drainage of the said Borough. To regulate the Removal and Prevention of Nuisances therein, and to make other provisions for improving the Sanitary condition thereof; to make bye-laws lor such purposes, and for carrying out any other purposes authorized by the Bill. To vest in the Corporation all the powers of Surveyors of Highways within the Borough, and to exempt the District within the Borough from the present Highway Rates assessable or leviable therein or in any part thereof, and to provide for the maintenance of the Highways within the Borough, and also of all Sewers therein, out of rates to be levied under the said Bill. To levy Rates oil all Owners and Occupiers, or Owners or Occupiers of Property within the said Borough, for all or any of the purposes of the said Bill, and to confer exemptions from the payment of such rates. To apply, either temporarily or permanently, any Money or Property belonging to the Corporation or applicable to the said Borough Fund, for carrying into effect all or any of the objects of the said Bill, and to raise money for such purposes by way of Sale or Mortgage of such Property, or by Mortgage of the Borough Fund and Borough Rates, or of any Property, Tolls, Rates, Rents, Duties, or other revenue to be acquired or arise under the said Bill, or by all or any of such means, or to apply any of such Tolls, Rates, Rents, Duties, or Revenue, for such purposes or any of them. AND IT IS INTENDED by the said Bill to incorporate therewith, and to extend to the purposes thereof, The Commissioners Clauses Act, 1841;” The Lands Clauses Consolidation Act, 1845;” The Markets and Fairs Clauses Act, 1847;” “The Water Works Clauses Act, 1847;” “The Towns Improvement Clauses Act, 1847;” “The Towns Police Clauses Act, 1847;” The Public Health Act, 1848;” The Public Health Supplemental Act, 1849; and The Harbours, Docks and Piers Clauses Act, 1847 or borne of the said Acts, or so much thereof as may be deemed necessary or expedient, and all other necessary powers and provisions. AND IT IS INTENDED by the said Bill, so far as may be necessary for effecting the objects and purposes thereof, or otherwise, to repeal, alter, or amend and confirm the Charter incorporating and establishing the said Borough, and also any Act or Acts in force within the Borough which it will be necessary to repeal, alter, or amend for the purposes of the said Bill, and to confer other and additional powers in lieu thereof. AND NOTICE IS HEREBY ALSO GIVEN, That Duplicate Plans, describing the Lands and He uses proposed to be taken compulsorily for the purposes of the said Bill, and also describing the termini of the Works to be constructed thereon, together with a Book of Reference to such Plan, containing the names of the owners, or reputed owners, lessees, or reputed lessees, and occupiers of the lands, houses, and other property which will be taken for the purposes of the said Bill; and also a copy of this Notice, as published in the London Gazette, will, on or before the 29th day of November instant, be deposited for public inspection with the Clerk of the Peace for the County of Cardigan, at his Office in Aberystwith, in the said County of Cardigan and that on or before the said 29th day of November a copy of the said Plan and Book of Reference, and also a copy of this Notice, as published in the London Gazette, will be deposited for public inspection with the Parish Clerk of the Parish of Saint Mary in Cardigan, at his Place of Abode in the said Parish of Saint Mary, in Cardigan. “…Cardigan Markets and Improvement Act 1857. TO BUILDERS AND OTHERS. THE Corporation of the Borough of Cardigan hereby give Notice, that they are ready to receive Tenders for the execution of the various works to be performed in the erection of Markets and Public Buildings. Separate Tenders will be received for the proposed Markets, Guildhall, and Grammar School. Plans and Specifications of the same as prepared by the Architect to the Corporation, Mr. R. J. Withers, 6, John-street, Adelphi, London, will be for inspection at the Town Clerk’s Office, in Cardigan, and duplicates thereof at the Offices of the Architect from the 10th to the 27th day of FEBRUARY inclusive. Lithographed Copies of the quantities may be obtained on application to the Architect by payment of 10s. 6d. Tenders are to be delivered at the Town Clerk’s Office, Cardigan, on or before Saturday, the 27th day of February, in sealed envelopes, addressed “Tender for Markets, &c.” The Corporation do not pledge themselves to accept the lowest or any other Tenders. The successful competitor will have to satisfy the Corporation with responsible securities for the proper completion of the works. The successful tender was that of builders David Jenkins, John Davies and John Thomas, priced at £2174.15s.0d. for the Market Hall and £1880. 5s. 8d. for the Grammar School and Guildhall. Demolition of the Grammar School commenced that year. In August 1857 Cardigan Borough Council fell out with R. J. Withers over his fees, and he was temporarily dismissed, but was reinstated before the end of the month. The new building occupied the site of the Grammar School, Master John Davies; the house of Abraham Morgan and the coach-house of David Davies. “…PUBLIC BUILDINGS AND MARKETS, CARDIGAN. The isolated town of Cardigan is so little known that we this week present our readers with a view of the New Town Hall and Markets erecting there, which are fast approaching completion, and when finished will be of great advantage to the town and immediate neighbourhood. The markets have hitherto been held in the streets, with the exception of meat, which was sold in a small confined space adjoining the old slaughter-house. The prospect of a railway and other completed local improvements, induced the Town Council in 1857 to apply to Parliament for an Act which was then obtained under the title of the “Cardigan Markets and Improvements Act,” for the purpose of building suitable premises for markets and other offices for the use of the inhabitants, on corporation land, and otherwise to pave, light, water and drain the town. Funds were raised by the mortgage of the Borough property, aided by improvement rates, and to R. D. Jenkins, Esq., now and for the last three years Mayor of Cardigan, the chief credit is due for carrying out these works to a successful termination. The land on which the buildings are erected falls rapidly from east to west; this has enabled the architect to economise space by placing one Market over the other, the upper one entered on a level from the High-street and the lower one from the side road. The public buildings face the High-street, and comprise on the ground level, a Corn Exchange 46 X 24 feet; a Free Grammar School 23 X 17 feet, with Library and Class-room 15 X 15 complete, with urinals, cloak-room, and staircase from side street. A lobby and stone staircase lead to the Town Hall, which is 57 X 24 feet adjoining which are two retiring rooms and waterclosets. A News-room 18 X 17 feet, and Council-room 17 X 14 feet, complete the range of public offices. The lower and upper Markets contain an area of 11, 000 feet, and are appropriated for the disposal of all produce brought into the town for sale. 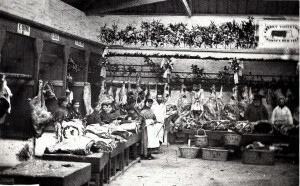 The Slaughter-house is situated on the level of the lower market a short distance northwards, and contains one spacious apartment 70 X 20 feet, fitted with all necessary gear and appurtenances for the slaughtering of animals sold in the markets, added to which there are sheds, yard &c., complete. The materials used in the erection have been the local blue and brown stones, for all walls whatever, banded with red bricks. The dressings throughout are of Box ground stone, relieved with coloured bricks in arches; the wood is Quebec red pine, and the roofs are covered with Caernarfon slates, to patterns of red and blue; internally, the roofs and floor timbers, as well as all joiners’ work, are stained and varnished. The total cost of buildings will be under £5,000. SIR – Lately, while staying in the town of Cardigan, I was not a little surprised to perceive in an out-of-the-way corner in the new market buildings, a cannon, which I afterwards found was presented to the corporation by the government in commemoration of the Crimean war. I hope you will allow me to call the attention of the inhabitants of Cardigan and the neighbourhood to the fact that, in almost every place where such presentment was made by government, the inhabitants went to the expense of mounting the gun on a pedestal, more or less costly, in a public place, in order, I suppose, firstly, to show their gratitude to the government for the gift, and secondly, and chiefly as a tribute of respect to the memory of the noble hearts that ceased to beat on the bloody fields of the Crimea. On inquiring, I found that no less than three officers from the neighbourhood fell in that terrible war, besides many private soldiers, and yet no tribute of respect is paid to them. Is it possible that Cardigan is so void of sympathy? I can hardly believe it. I feel sure that if a subscription were got up the cause would meet with general approbation, and before long the Russian gun would be fixed on a pedestal in some public place in the town, such as before the new market buildings or Finch’s-square. It would be an adornment to the town. On 28th June 1864 Rev. Rees Williams, Headmaster of Cardigan Grammer School married Elizabeth Rees, daughter of the late Rev. Thomas Rees, rector of Mwnt and Ferwig. 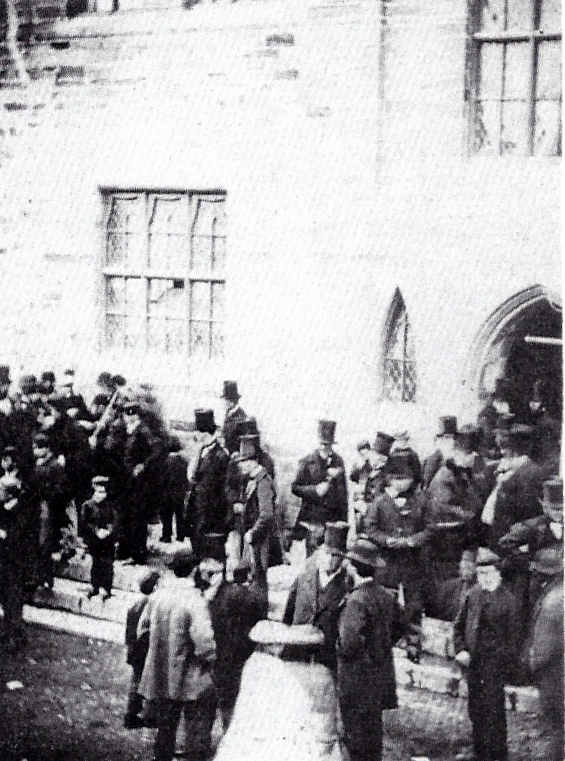 On 17th January 1865 the surveyor reported to Cardigan Borough Council that the walls of the Guildhall were cracking and on the point of collapse. In 1866 the part of the building used by the Mechanics Institute began to collapse and had to be rebuilt. Decorative iron ties were added and the chimney stack opposite College Row was rebuilt. The architect was Mr. Parker of Thrapston. 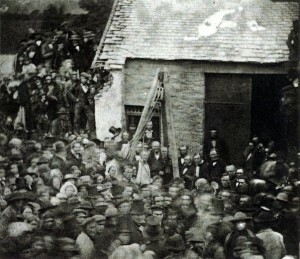 An auction was held here on 23rd September 1870 to sell of parts of the Cardigan Commons. On 26th May 1871 the Russian Field Gun was moved from the dirt and weeds of the old market yard and placed on the Guildhall steps, where Alderman Thomas Davies of Parkypratt supplied new wheels and mounting on 23rd October 1871. Some alterations may have been conducted to the building that year. 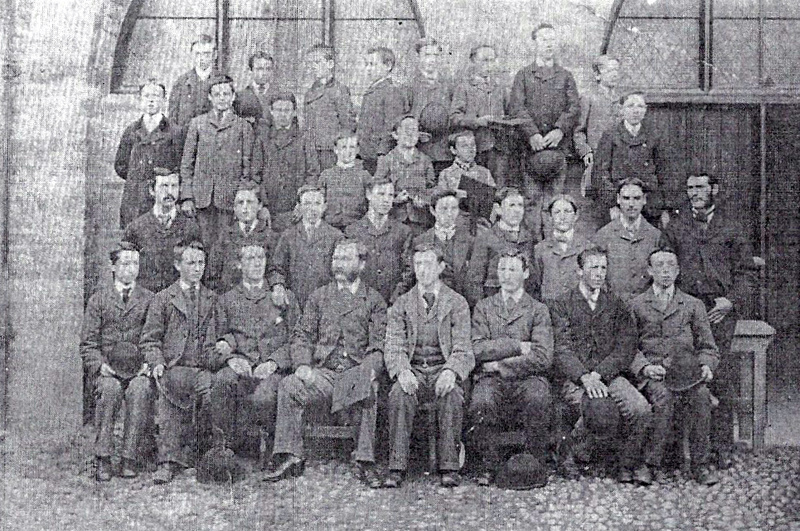 In 1871 Edward Hughes was the honorary secretary of the Mechanics’ Institute and Rev. Rees Williams was the Headmaster of the Grammar School. David M. Palmer became the Headmaster in 1874, having formerly run the “Cardigan Academy” at Quay Street. In December 1874 the Mayor of Cardigan, Levi James, commented on the bulging state of the front of the building. Cllr. William Woodward stated that unless the front of the building was “stayed” to the back, it would collapse. In February 1875 four iron bolts were fixed from east to west in the walls of the Guildhall, with pillars and girders to support the joints and decorative cast iron plates to the tie-rods. The Mechanics’ Institute was described as “flourishing” that year. In 1874-87 David M. Palmer was the master of the Free Grammar School. ‘Popular Entertainment’ events were held here in 1876. “…CARDIGAN GRAMMAR SCHOOL. DISTRIBUTION OF PRIZES. The annual distribution of prizes took place at she above school, on Thursday last, in the presence of the Mayor (who was chairman), members of the Town Council, and several other gentlemen who feel an interest in the school. The Chairman, after expressing the great pleasure it afforded him to be present, called upon the head master (Mr. D. M. Palmer, B.A.) to read the reports of the examiners. Mr. Palmer then read the following reports: To the Mayor, Aldermen, and Councillors of the Borough of Cardigan. Gentlemen,—I have had the honour of examining the scholars of the Grammar School, Cardigan, in the Greek and Latin languages, in French, and Scripture History, and it affords me very great pleasure to be able to send in the following report The work done by the senior classes in the Aeneid of Virgil, in Cicero’s De Senectute, and in Caesar’s Gallic Wars, respectively, as well as in the Anabasis of Xenophon, was highly satisfactory. The various extracts from the originals were, as a rule, very faithfully rendered in English, though some excelled the others in the elegancy and correctness of their composition. The character of the answers to the grammatical questions given will, I feel confident, bear a favourable comparison with the work done in similar institutions. I was also very much pleased with the accuracy of many of the papers in French Grammar. The translation of the extracts from Charles XII., was, on the whole, very correctly done. Amongst the juniors there is a greater diversity of excellence. Some have done very great credit to themselves and their master. A few, however, are in a more backward state. But as I presume that most of these are only just commencing the study of the classics, and young withal, no word shall be written to discourage them. Let them persevere, and in time they shall be brought past the wearisome bitterness of their learning.’ I may justly congratulate the master on the evident thoroughness and efficiency of the teaching as well as the scholars on the proofs they have given of assiduity and painstaking care. I append the list containing the result of the examination of the members of the several classes, arranged in order of merit. I have the honour to be, yours respectfully, “DAVID ADAMS, RA. Hawen, Dec. 22, 1880. In 1881 the steward of the Tivyside Race Meeting complained that the Guildhall was a disgrace to the town and was not in a fit state to be used as a ballroom. He offered to contribute towards the cost of improvements and, as a result, the council spent £15.18s.6d. on redecoration and ornamentation of the rooms concerned. In 1882-85 D. M. Palmer was the Headmaster of the Cardigan Grammar School and Thomas Thomas was his assistant. Ca. 1887 a magic lantern entertainment was held here. The complex is marked on the 1887 O. S. map. “…A HANDSOME GIFT TO CARDIGAN. INTERESTING PROCEEDINGS. On Wednesday a magnificent public clock and turret were presented to the town of Cardigan by Mr David Davies, Mayor, when the public acknowledged the handsome gift by presenting him with an illuminated framed address. The town was gaily decorated with flags and bannerettes, the main streets being spanned by streamers of flags from window to window. 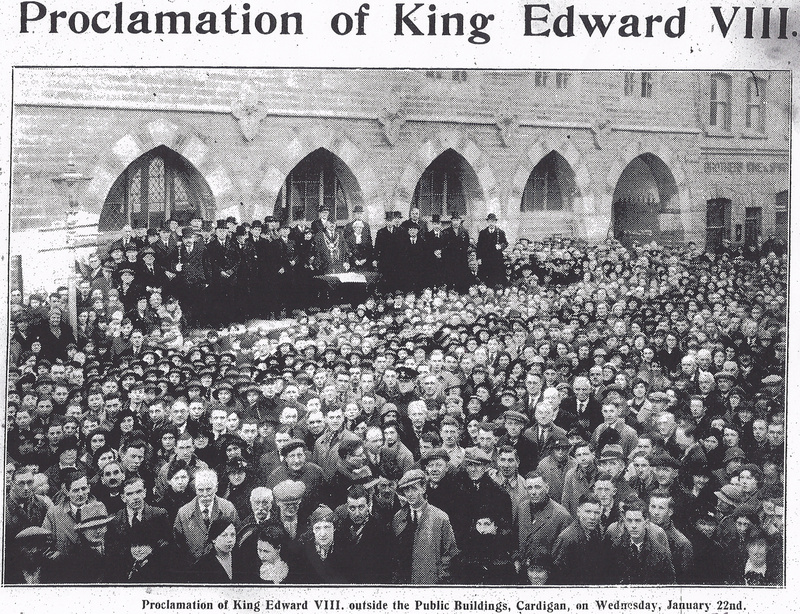 At 2.30 an open-air meeting was held in front of the public building over which the clock is placed. Ald. 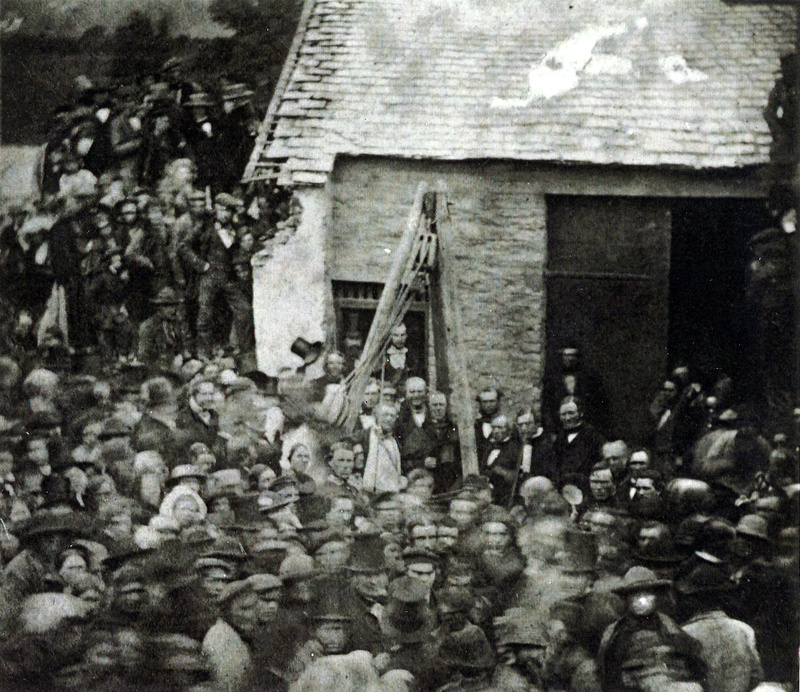 Phillips, M. D., presided, and on the raised platform were the Mayor and Mayoress Rev. Henry Stephens and Mrs Stephens; Mrs Phillips (Bank House) the members of the Corporation and Borough magistrates. There was a very large gathering of the public present. The Chairman said the clock had been manufactured by Messrs. Smith and Sons, Derby, and it possessed all the latest improvements. It had four illuminated dials with automatic lighting apparatus. The clock strikes the quarters and hours. To David Davies, Esq., Mayor of Cardigan. Dear Mr. Mayor, We, the undersigned, as representing the inhabitants of this ancient borough, hereby desire to express our high appreciation of the manner in which you have hitherto filled the Civic Chair and discharged the duties of Chief Magistrate; and more to offer you our sincere thanks for so generously presenting to your native town the handsome Clock and Turret, which now adorn its Public Building, and which will prove to be a great boon to the public and a lasting monument to your liberality. (We cannot refrain from expressing our pleasure at that success which has enabled you as a fellow- townsman to perform such a gracious and generous act; and we sincerely trust that you and your good wife, the Mayoress, may have a long life of happiness and continued prosperity, and that your children may emulate the good example which you have set them. Signed Aldermen-J. M. Phillips, M.D., J.P., Lewis Evans, J.P., Robert E. Rees, W. Woodward, J.P. Councillors-O. B. Evans (ex-Mayor), Thomas Griffiths, E. Ceredig Evans, J. C. Roberts, Ivor Evans, Benj. James, Scott F. Kelly, Evan Jenkins, W. J. Williams, Dan Evans, D. Davies D. Morgan Jones, Town Clerk. Justices- Thos. Harris, Levi James, W. Picton Evans, Thos. Edward Davies, W. Davies, MR.C.S.,Wm. Lewis; Henry R. Daniel, Justices’ clerk. Ministers- Wm. Cynog Davies, B.D., Griffith Davies, T. J. Morris, George Hughes. Cardigan, August 31st. 1892. Mrs Phillips (Bank House) then made the presentation on behalf of the Committee. The Mayor responding, said he did not know how to thank them sufficiently for the elegant address that had been presented to him and his wife. He should consider it as the greatest treasure he had in Stanley House, bis wife and children excepted—(laughter)—as it had been presented to him by the public. The Chairman having unveiled the commemorating marble tablet placed on the turret by the Corporation, the band played- “For he’s a jolly good fellow.” On the motion of Ald. Evans; seconded by Mr Picton Evans, a hearty Vote of thanks to Aid, Phillips for so ably presiding was passed. At the close of the proceedings Mr Ceredig Evans succeeded in obtaining an excellent negative of the public buildings, clock and turret, and assembly. It is estimated that the turret, clock, etc., will cost the Mayor about £500. At 4 o’clock the Corporation officials and work-men were entertained to a splendid dinner by the Mayor at the Fat Ox Inn. A COMPLIMENTARY BANQUET TO THE MAYOR. At 7 o’clock a complimentary banquet was given to the Mayor at the Black Lion Hotel, when over 80 gentlemen were present. The chair was occupied by Aid. Phillips, M.D., J.P, and the vice-chairs by. Col. W. Picton Evans, J.P., and D. G. Davies, J.P. The guest of the evening (Mr Davies, Mayor), on entering the room was received with acclamation, and took his seat on the right of the chairman, who was supported on each side by the members of the Corporation. The Volunteer Brass Band played a selection of music; in front of the hotel during the dinner time. The room was very nicely decorated, and the tables tastily laid out with flowers in pots and otherwise. The banquet proved a perfect success. The following is the FULL MENU :— Soup-Julienne. Fish. Salmon. Turbot Sause Piquante. Lobster sauce. Joints., Fore Quarters of Lamb. Roast Beef. Saddles of Mutton. Boiled Legs of Lamb. Boiled and Roast Chicken. Ham and Tongue. Roast Ducks. Sweets. Cabinet Puddings. Plum and Apple Tarts, Trifles. Cakes And Jellies Desert. Grapes. Pears. Apples. Filberts. Cakes, Biscuits, etc. Ample justice having been done the good things provided, and the tables cleared the Loyal and Patriotic toasts given from the chair were duly honoured. Mr D. G. Davies, vice-chairman, gave “The Army, Navy, and Reserve Forces,” coupled with the names of Mr Buckham and Col. Picton Evans, who responded. Col. Picton Evans in proposing “the health of the Bishop, clergy and ministers,” said he was sorry to find that the ministers were absent. They should be with their flocks on such occasions. The Rev. W. Cynog Davies responding for the clergy remarked that he represented the “mother church, and she had been a good mother to them all. Though she was nearly 2,000 years old, yet in her old age she was very vigorous, and her sons and daughters were dutiful and active every- where. He was of opinion that her sons and daughters who were outside her pale were doing all they could for the welfare of the country. (Cheers). The Chairman in proposing “Our Guest,” remarked that he had known Mr Davies since he was a boy in his pinafore. (Laughter). He was a gentleman who was always bent on doing his duty, and that day he had entered the class of one of the most liberal Mayors in the country. The toast was drunk with musical honours, “For he’s a jolly good fellow” being sung with heartiness. The Mayor, on rising to respond, was received with acclamation. He said he was greatly obliged to them for the kind manner in which they had received his name. They had, in his opinion, done him too much honour. (Cries of No “). The beautiful address that was presented to him complimented him on the manner he had discharged the duties of his office but he assured them that, were it not for the kind assistance rendered him by his colleagues, he could not have done what he did. There was not a body of men who looked more keenly after the interest of the ratepayers than the Corporation. In the face of all that was said he thought there was a prosperous future before Cardigan they had more visitors among them this summer than ever they had before Gwbert had brought a large number of visitors among them. He could assure them that he much appreciated the honour conferred on him that day. On 14th April 1893 there were proposals for a fire escape at the Guildhall. In January 1895 people attending meetings at the Guildhall, were advised by the local press to wrap themselves in blankets. The hall was so cold that one journalist told the Cardigan Borough Council to consider letting it to a frozen meat company for use as a refrigerator! A public meeting was held here in May of 1895, addressed by Wynford Phillips. On 26th July 1895 it was complained that children with catapults had made two holes in the face of the clock. 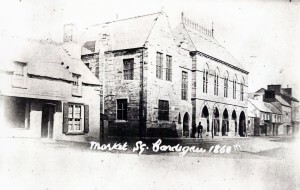 In August 1895 a bazaar was held here in aid of St. Mary’s Church. The new Cardigan Intermediate School was temporarily housed in the old Grammar School. The rooms were cleared in readiness on 11th October 1895 and re-opened on 4th November 1895 as “The Intermediate School for Boys”, with David M. Palmer as Headmaster, Charles Owen his deputy, and Miss Gladish. David M. Palmer resigned in December, leaving Charles Owen, M. A., as the Headmaster. In November 1895 tenders were sought for building a lobby at the Guildhall. In January 1896 Charles Owen officially became the Headmaster of Cardigan Intermediate School and Miss Bessie M. Davies, the Mistress. On 22nd May 1896 the Mayor of Cardigan, Benjamin James, proposed replacing the “…grand arches our forefathers were so foolish enough to build…” in the market, with cast iron pillars. On 14th September 1896 Dr. Daniel Rees, M. A. was confirmed as the new Cardigan Intermediate School Headmaster. Charles Owen and Miss Gladish resigned. Miss Dora Lewis became the Senior Mistress on the same date. The school moved to the new building in 1897. On 8th July 1898 it was proposed that the chimney of the old Grammar School be rebuilt as it was dangerous. In August 1898 Velograph Moving Pictures were shown here, depicting the Spanish-American Civil War and the funeral of W. E. Gladstone. 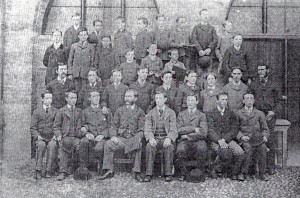 On 24th March 1899 ownership of the Grammar School rooms was disputed, with the managers of Cardigan County Secondary School making an unsuccessful claim to it. The 1899 town guide gives a description and photograph of the building. 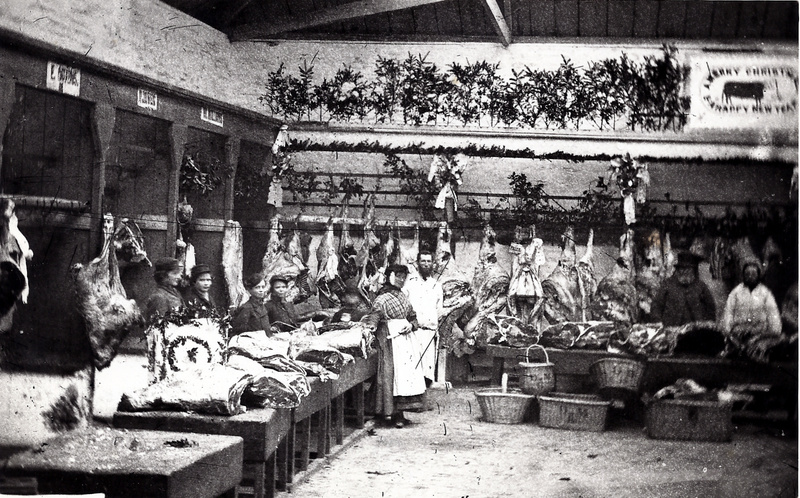 The “Cardigan Fatstock & Poultry Show” was held here on December 6th 1899. 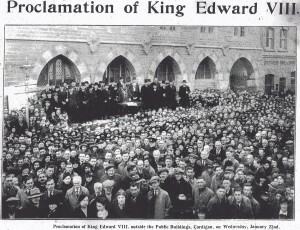 In 1901 the building was lit up for the coronation of Edward VII. On 18th March 1902 a fire caused damage to the Council Chamber and the Old Grammar School rooms. On 18th April 1902, in a bid to provide a large meeting hall in the town, removal of the market pillars and arches was again considered. On 9th December 1903 a marble Scroll of Honour was unveiled here, in recognition of theCardigan Volunteers of the Boer War, by Mrs. Davies-Evans of Highmead, Llanybydder. A Ladies’ Choir Concert was held here on 10th June 1903. In September 1904 Cllr. John Evans proposed moving the Russian Field Gun to another location and received support from other councillors. The weight of the gun, however, meant that it stayed where it was! On 11th September 1905 the Council Chambers were moved to the former Mechanics’ Institute rooms. On 4th January 1907 tenders were sought for renting the Lower Market as a warehouse. On 5th February 1907 Cardigan Borough Council resolved to use it as a store for traps. The “Tivy-Side Fanciers’ Association Show” was held here on 5th January 1907. 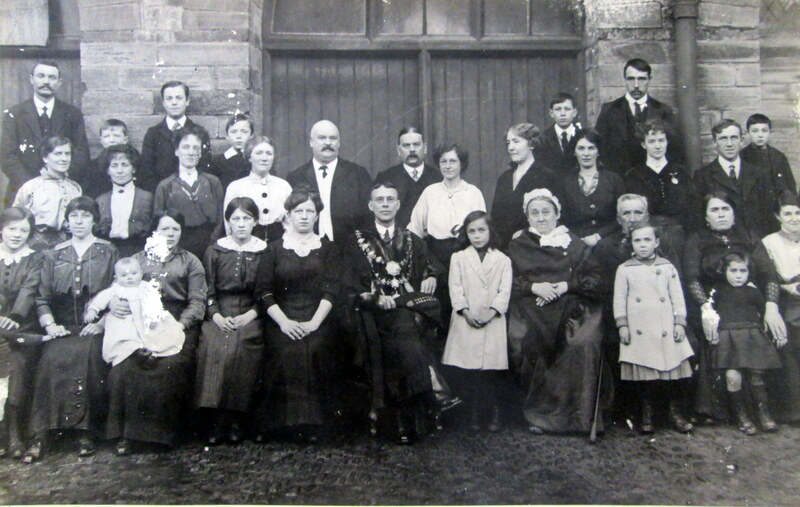 On 4th August 1908 the Mayor of Cardigan, Cllr. John Evans, proposed removing the stone arches in the upper market once again. On 19th November 1909 the provision of a fire-escape from the Guildhall to the market courtyard, was proposed. On 18th January 1911 a dance was held here in honour of Miss Marion Ayling of Quay Street, who had taught dancing in the town for nearly fifty years. On 29th March 1911 a benefit concert for the Fire Brigade was held here. On 17th March 1911 it had been proposed to alter the Upper Market by removing the stone flags and laying timber, removing the arches, installing new windows, and covering over the courtyard. This was approved, but support for the plans rapidly dwindled and nothing came of the scheme. On 25th January 1912 a public meeting held here resulted, ultimately, in the building of the Pavilion cinema and hall on Napier Gardens. In March 1912 it was suggested that the Upper Market be altered for use as a public hall. In 1914 Caleb Luke was the inspector and Daniel Owen Thomas was the collector for the markets. Henry David James was the Honorary Secretary of the Mechanics Institute. On 14th August 1914 the building was put at the disposal of the Red Cross. Three days later there was a call for men over 30 to volunteer for the War and to sign up here. On 22nd March 1918 the library and reading room were taken over for use as the Town Clerk’s offices. 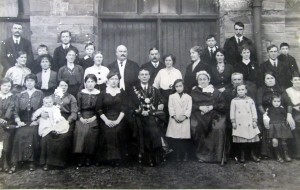 In November 1918 the mayor, Cllr. John Evans, presided over a meeting at which it was decided to create a hospital in the town. On 12th August 1925 a dance was held here in aid of the hospital. In 1926 D. John Rotie was the hall keeper. From 11th January to 30th March 1927 a soup kitchen was held at the Corn Market. On 2nd February 1934 a coming-of-age celebration was held here for Edward Howard Lloyd of Coedmore, Llechryd. The 1935 Annual Fatstock & Poultry Show was held here on 4th December that year. In 1937 there was a reunion of master mariners in the Guildhall courtyard. On 16th August 1940 the ironwork of the Borough of Cardigan was being claimed as “salvage”. It was granted that, in view of its’ sterling efforts, the Borough could, for the time being, retain the Russian Field Gun. 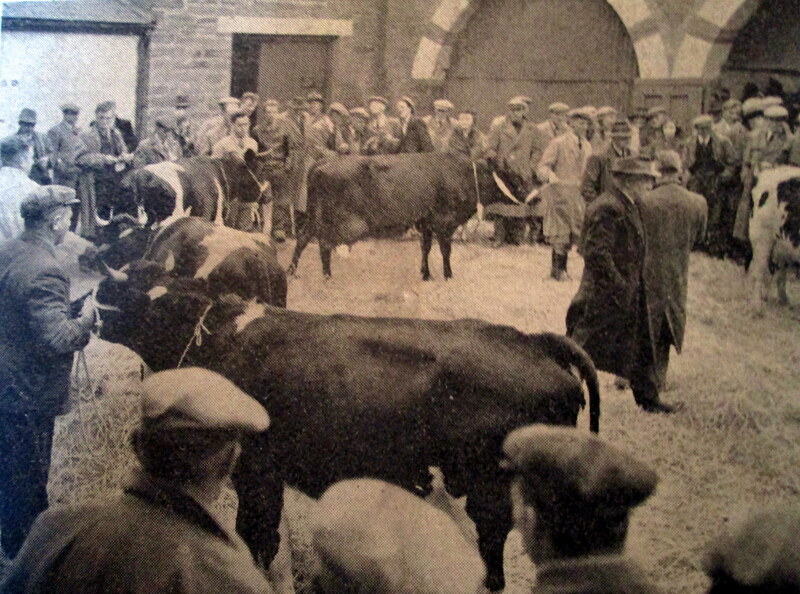 On 17th January 1941 a scheme was announced to turn the meat market into a social centre for the troops. On 22nd August 1941 Cllr. Jimmy Davies and Cllr. Rosina Davies, No. 38 High Street, proposed that the Russian Field Gun should be scrapped for salvage for the War effort. The proposal was made again on 17th April 1942. By 12th February 1943 the Cardigan Petty Sessions had been removed to the Priory Street courthouse. On 20th July 1945 Cardigan Borough Council was facing criticism for refusing to allow a boxing match to be held in the meat market. On 8th March 1946 the use of part of the Guildhall as a social centre for young people was rejected by Cardigan Borough Council, who were considering the use of the corn market as a reading room. In November 1946 Dan Williams, Y Bwthyn, proposed the demolition of the Guildhall to make way for a new memorial hall. He asked “Is an 80-year old jerry-built structure in stone with trussed walls worth preserving?” On 14th February 1947 plans for a County Library here were considered. Calls for a library continued into the summer of 1948, with more formal plans for the corn market to be used as a library on 13th August that year. Cardigan Library opened here on 5th February 1950. On 30th June 1950, former mayor of Cardigan Cllr. Rosina Davies of No. 38 High Street, resigned from Cardigan Borough Council in protest at their decision to allow a boxing match to be held in the market. On 11th January 1952 Cardigan Chamber of Trade called for the Guildhall market to be replaced by a parking ground. A Girl Guides’ sale and fun fair was held here on August 14th 1953. On 1st February 1957 a museum was proposed for the Lower Market. On 21st May 1958 Cardigan’s Mayor, Cllr. Cyril Lloyd, complained bitterly that vandals had painted the cannon red. In 1961 the Guildhall and Markets complex was ‘listed’. On 23rd November 1961 Cllr. R. C. Vernon Smith suggested converting Cardigan Market into a shopping centre. On 9th March 1962 furniture sales here were banned. On 4th April that year, a children’s section opened at the library. On 8th March 1963 Cardigan officials firmly rejected proposals for the demolition of the Guildhall, although conversion into a precinct was considered. On 13th September 1963 the new Guildhall Shopping Arcade proposals were unveiled and supported by the Cardigan Borough Council. By 15th November 1963 Cardigan traders were voicing their protests at the scheme. Plans were still being considered on 17th January 1964, but the plan was dropped on 12th June that year. On 14th January 1966 it was declared that Cardigan’s municipal offices were “…below standard…” and that new offices were needed. On 21st January 1966 gates were proposed for the archway leading to the Upper Market. On 29th April 1966 Cardigan Borough Council elected to move their offices to the corner of Priory Street and Morgan Street. On 27th January 1967 there were proposals for a new staircase from the Upper to Lower Markets. By 3rd March 1967 the Guildhall was being considered for use as a police station, and, just one week later, demolition was proposed again. On 24th May 1967 Cllr. Ivor John C. Radley of Pendre became the Mayor of Cardigan again, and launched a project to use former offices here as a Centre For the Aged. On 21st May 1968 the Senior Citizen’s Centre opened here. On 28th June that year, the Guildhall was said to be running at a loss of £1000 per annum. On 17th January 1969 it was proposed to open up the Lower Market in a £7000 scheme. On 25th July 1969 pupils of Cardigan Junior School presented a mural. Major renovations included a new staircase, new ceilings and asbestos walls. On 26th December 1969 it was proposed to move the library to Hope English Congregational Chapel, Pendre, and open up the arches. By 6th February 1970 gates had been erected at the market arch. Proposals to open up the arches continued. By 23rd May 1975 the muzzle of the cannon had been sealed. By 9th January 1976, 60 mph gales had damaged the roof. In 1991 alterations were conducted to the steps at the front of the Guildhall and a chimney stack was removed. By 10th September 1993 plans were afoot to relocate the library, and this was confirmed on 18th March 1994. It had been removed by 14th September 1994. By 3rd November 1994 Hanes Aberteifi claimed that their proposals to turn the former library into a heritage centre were being thwarted by a lack of communications from the Ceredigion District Council. By 2nd March 1995 work had begun on restoring the Upper Market – removing the asbestos panels and false ceilings and exposing the original structure. Cllr. Derek Gadsby’s Mayor-making ceremony was held here on 9th May 1995. Similar ceremonies took place here in 1996-99. In August 1995 the Mediaeval Day market was held here, and annually for four years. On 21st November 1996 Ceredigion Training moved into the former library rooms. On 5th October 1998 Cardigan Town Council expressed an interest in taking on the first floor of the Guildhall. Planning permission was granted in January 1999 for the placing of a ‘Millennium Countdown Clock’ here. In 2001 there were proposals for the building to be leased to Cardigan Town Council and Menter Aberteifi. A feasibility study was planned in 2002. Repairs began in April 2003. There were proposals by Menter Aberteifi to replace the Upper Market with the Town Library, to add a tower containing a lift to the NW angle of the Market Hall, to block the existing market arch and open up two of the centre arches from Pendre, and to add an extra storey above the former school rooms to the south. In May 2004 it was announced that the building was to be leased to Menter Aberteifi. A plaque commemorating the anniversary of the Charge of the Light Brigade was added to the Russian Field Gun and unveiled on 25th October 2004. In January 2006 work began on a refurbishment and strengthening of the floors. Alterations to the building, including the opening of the arches, were proposed by Menter Aberteifi. In August 2007 work began on a new lift shaft and other alterations. In late October 2008 work began on re-opening the two centre arches to serve as doors. In July 2009 a gallery occupied the former Corn Market, Cardigan Town Council occupied the former Council Chambers, and Menter Aberteifi moved into the former caretaker’s office. By 2010 the complex was fully operational. The building is now well-subscribed. “…1858-60 buildings, originally Guildhall, Corn Exchange, Grammar School, News-room, Corn Store and Markets, by R. J. Withers (1823-94) in Ruskinian Gothic style, the first of their kind in Britain. Coursed blue lias stone with some red brick banding and ashlar dressings, the ashlar since painted white, and banded slate roofs. Gothic of mixed Italian and North European derivation, following Ruskinian precepts in structural colour and the integrity of the wall-face maintained by minimal moulding and window tracery set flush. Five-bay 2 storey main hall with unmoulded polychrome Gothic arcade below to former Corn Exchange, now library, and tall mullion-and-transom stone windows above with linked pointed hoodmoulds. Coved ashlar eaves cornice with carved bosses and steep hipped roof with ornamental iron cresting. Adjoining to left, recessed entrance with pointed doorway, tall stair-light and top clock turret, lead-clad with pyramidal spire, added 1892 (R Thomas of Cardigan). To left, crossing with single window below and 2 windows above, pointed red brick relieving arches and timber mullion-and-transom windows. Coped gable. Two-bay side elevation to College Lane with stone centre side-wall stack. Rear of Guildhall has ground floor 5-bay arcade and 2 windows above with centre side-wall stack. Behind crosswing, lower range, 2-storey to College Lane, one to rear court, slightly projected with roof hipped forward. Rear to court has hipped gable to right of former Corn Store. Early C19 Russian cannon at SE corner of Guildhall. Markets are designed to a remarkable functional Gothic design, open-well plan with glazed ridge lighting for upper floor. Polychrome external arcading to lower level to College Lane and to rear, where sloping site gives high plinth below arcade. South west angle is chamfered. From courtyard, 2-bay arcade with entry to upper level. Interior has complex stone vaulted lower level, 2-bays deep each side of centre light-well. Painted circular piers with blue lias pointed arches and rubble tunnel vaulting. Light well is arcaded, 3 times 2 bays on 2 levels and upper floor is slate flagged. Timber roof trusses masked by C20 suspended ceiling. C20 stair in light well, original stone stair in south east angle. Guildhall has stone stairs up under panelled 4-sided roof, small version of 5-bay main hall roof, which has hipped ends and pierced timber panels over wall-plate. Painted stone fireplace with commemorative plaque. Library below has cast-iron columns. ADDITIONAL (2001) – Old photographs show paired boarded timber doors beneath timber lintels to two middle arches of E façade. 1962-64; 1966-70; 1973; 1975-76; 1988; 1993-96; 1998-2009-10. Poster – Popular Entertainment, Guild-Hall 07/11/1876; 08/12/1876. O. S. Map 1887 etc. Feasibility Study Brief – Guildhall, Cardigan 2002. What a fascinating account! I thoroughly enjoyed reading the history and must congratulate you on all the research you have done. I am looking forward to coming down to Cardigan in the summer and revisiting the building. Well done!